This week marked yet another fast and productive week at the project site. 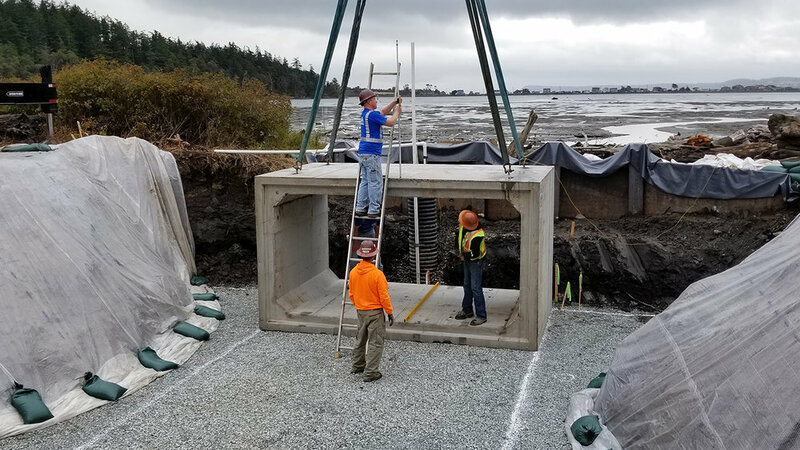 The box culvert was delivered on Tuesday, and by Friday afternoon, Barnum/Triangle Bay Road was re-opened. The road section at the stream where work occurred is currently loose gravel, so please drive slowly and use caution when driving the road. The graveled area on this road will be paved at the same time as Russell Road, so the exposed gravel will be around for a bit. The contractor expects to post the road closure signs and detour signage for the Russell Road closure today (Friday), although you will be able to drive Russel Road this weekend. Russell Road will be closed for your Monday morning commute/school route. You will be able to use Lehman Dr., Barnum/Triangle Bay Rd., or the long way around via Sunrise Blvd. and Shumway Rd. during the Russell Road closure (that long route is the detour route). I want to thank everyone for keeping the construction area safe and staying behind the road closure barriers. We will continue to share photos of the work on the project webpage. Dawn Pucci, Commissioner Rick Hannold, and Amber (Coupeville office) from Island County standing on the newly placed Barnum Road culvert. The first box culvert is placed. You can see Triangle Cove in the background and the contractor and team for scale. Original citizen volunteers who identified this project as a priority for salmon recovery, over 15 years ago. Barbara Brock and Bob Friedman watch as the box culvert sections are placed. Barnum/Triangle Bay Rd. is open, but the work area over the stream is not yet paved. Gravel covers the road for about 35 ft. Use caution and drive slowly. Do you have questions or comments about the fish passage project? Call or email Kristin Marshall, project manager, at 425-377-7017, kristin@snohomishcd.org. Would you like to receive project and construction updates by email? Do you have any comments you want to share about this project?